Based in Shanghai with a global mind (15+ years of intercultural experience in Europe, Asia and West Africa), Liu Yi is a professional facilitator, trainer and consultant of learning and communication, diversity & inclusion expert supporting personal and organizational development and transformation with objectives to serve the health, inclusiveness and empowerment of organizational and individual beings. Her practice is informed by integrated methods, ideas and approaches, such as participatory facilitation, gaming and simulation, art-based practices, etc. 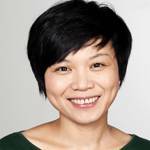 She has deep knowledge about society trends, understanding of grass roots movement in China related sustainability initiatives and social innovation. She holds a masters degree in Cultural Studies from the University of Edinburgh, and has worked with the United Nations in Bonn and Liberia as a communication specialist, and later as a visual anthropologist researching and filming diverse communities in Yunnan province. She is a certified intercultural trainer and a certified non-violent communications trainer candidate, and currently being trained with Emerson College, UK as Anthroposopy trainer.